Type text or phrases into a search box, to translate to a desired language. Audio book recordings of books in the public domain, in many different languages, most of which come from Project Gutenberg. High-quality cultural & educational media for the worldwide lifelong learning community. A collection of video clips in which native speakers elaborate about their culture, family, and daily life. OhioLINK membership includes the State Library of Ohio, 16 public university libraries, 51 independent college libraries, 23 two-year college libraries, 16 regional campus libraries, 8 law school libraries and 5 medical school libraries. Free course materials and other educational resources. "The Open University’s mission is to be open to people, places, methods and ideas. We promote educational opportunity and social justice by providing high-quality university education to all who wish to realise their ambitions and fulfil their potential. Through academic research, pedagogic innovation and collaborative partnership we seek to be a world leader in the design, content and delivery of supported open learning." On this page you will find open access Language textbooks along with supplemental materials. The purpose of these subject specific pages is to highlight content for those who are interested in what open educational resources are available. This list of content is by no means exhaustive. The nature of open educational resources is very collaborative and we encourage comments about the content featured on this page, or recommendations of content that are not found here. Resources such as language courses and grammar lessons produced to support language development and to more accurately represent dialect. A range of language learning resources available as open courseware, under the Creative Commons License. A grant-funded group at Carnegie Mellon University offering innovative online courses to anyone who wants to learn or teach. Their aim is to create high-quality courses and contribute original research to improve learning and transform higher education. A guide which provides information on finding Chinese-language resources in the science, technology, engineering and mathematics fields. A collection of free interactive language learning resources for beginning Mandarin Chinese. Students have the option to practice pronunciation, vocabulary, grammar, listening, and reading skills at their own convenience. Tex's French Grammar (la grammaire de l'absurde) is a pedagogical reference grammar that combines explanations with surreal dialogues and cartoon images. 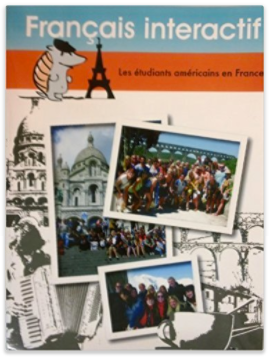 Liberté, by Gretchen Angelo, is a first-year college French textbook with a true communicative approach. It has been adopted by instructors at over thirty colleges and high schools (partial list below). The textbook may be downloaded for free in accordance with the license, or printed copies can be ordered. Please contact me for information on printed copies or requests for audio. About the Author: I teach French language and literature at California State University, Los Angeles. If you think you might be interested in using Liberté in your classroom, I would love to hear from you. My e-mail address is gangelo2 at calstatela dot edu. Le site Enseigner le français avec TV5MONDE propose de nombreux scénarii pédagogiques et des déroulés de cours, à utiliser tels quels ou à adapter. Reportages, clips musicaux, extraits de courts métrages, magazines, films d’animation, etc. sont l’occasion de construire des séquences didactiques. An online, non-traditional language learning program for beginning and early intermediate students of German. The main premise of Deutsch im Blick is that learning a foreign language should focus on learning language in use. Thus, all activities are guided by real-life, plausible language situations. A textbook for those with no previous German experience designed so the learner may accurately understand formal written German prose, aided only by a comprehensive dictionary. An extensive collection of online courses including lecture videos, interactive concept quizzes, problem sets, terms and definitions, suggested topics and links, and exams. A course designed to build oral proficiency by expanding knowledge of vocabulary and grammar. A course which examines the major aesthetic, social, and political elements which have shaped modern Japanese culture and society. There are readings on contemporary Japan and historical evolution of the culture are coordinated with study of literary texts, film, and art, along with an analysis of everyday life and leisure activities. An introduction to modern standard Japanese with an emphasis on developing proficiency in speaking and listening, using basic grammar and vocabulary. Basic skills in reading and writing are also taught. A resource which provides intermediate and advanced learners of Portuguese a chance to hear people talk about real things in Portuguese using unscripted, role-playing scenarios. A major repository of the digitized print materials, with a goal of making Portuguese print items available to the rest of the world. A repository with the objective of storing, preserving, divulging and giving access to the intellectual production of the University of Minho in digital format. Podcasts designed to help those who are learning Portuguese, especially for those with a previous background in Spanish. A resource designed to give further exposure to the Russian language and culture through the medium of Russian music videos. A free, web-based textbook that provides a comprehensive introduction to Russian language and culture. It is organized around the experiences of four American students, each spending the academic year in a different Russian city. Their interactions with host families, roommates, fellow students and teachers create a universe of contextualized information that motivates the use of the target language in the classroom. A repository for lessons, activities, syllabi, and other resources created, adapted, or found for use in the University's Heritage Spanish classroom. Practice exercises, instructional videos, and a personalized learning dashboard that empower learners to study at their own pace in and outside of the classroom. A resource geared toward helping language learners acquire the vocabulary of the physical world using an image based guide which contains over 2000 words. Due to its visual nature, the guide can be used worldwide, regardless of the student's language. The objective of the exercises is to provide students of Spanish with the necessary tools to be able to talk about the same topics in Spanish.